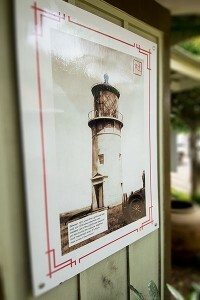 This image of the Kilauea Lighthouse is one of dozens of large scale historical displays in the Kong Lung Center. To look at Kilauea Town today is to look back in history over 100 years ago. The small town still has many of the buildings that rose up during the area’s long plantation era. But Kilauea’s story starts before that. It begins with the native Hawaiians who lived in this area for centuries living off the fish they caught in the ocean and the taro (the green leafy plant used to make poi) they grew in fields. They were not isolated. In fact, they likely traded their catch and their crops with inland dwellers who were growing fruits and vegetables or with whalers who picked up goods on other islands. When the haoles (nonPolynesians) arrived, a colossal shift in local life started to take place—from growing and catching what was needed to large-scale agribusiness. The seeds of this change were literally planted by the island’s early inhabitants who brought sugar cane to the islands with them. Sugar cane is a grass that can grow up to 20 feet tall in the saturated tropical environment. After harvest, it is pressed to extract the sweet juice, which is boiled down to produce sugar. Kauai’s first sugar plantation opened in 1835, and farmers immediately started experimenting with irrigation techniques to keep their crops adequately watered. The area that is now Kilauea was selected to be the site of a sugar plantation. Its expansive, flat land that made working crops much easier than many other areas on the island. When Hawaii and the U.S government signed the 1875 Treaty of Reciprocity, free trade between the two nations opened up, creating a huge market for Hawaiian sugar producers—an industry that would last a full century. Not long after the Kilauea Sugar Plantation incorporated, the flat land proved beneficial for another reason: railroads. Moving horse-drawn wagons full of cane over unpaved roads was a slow and inefficient proposal, so the plantation became the first of its kind in Kauai to move raw materials from the field to the refinery by train. The original track ran about 3 miles long. Soon, other plantations followed suit, and Kauai had hundreds of miles of train track, although none of it was used for human transportation. The Rapozo family has been in Kilauea for several generations. 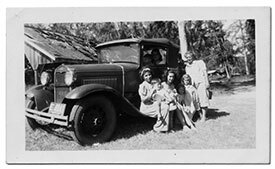 Here they are posing with their Model A at their home in Kilauea. The sudden growth of sugar enterprises across the island quickly overwhelmed the local workforce, and plantation owners began looking outside Hawaii for laborers. Many came from Portugal, Hawaii, and Japan, along with numerous other countries. Workers’ living quarters were often divided by nationality, but the sheer size of the plantation made Kilauea a melting pot of various cultures, languages, and religious beliefs. Throughout the year, the different nationalities would share and celebrate their own cultural holidays. For instance, the Japanese had Boys and Girls Days, the Philipino workers had Rizal Day, and the Hawaiians celebrated Lei Day. The company provided for many of the workers’ needs, including medical care, plots of land to grow food, and each family (at least for a time) was allowed a milk cow and grazing land. Since the population of workers was largely men, the plantations also had to provide entertainment in order to keep the laborers out of mischief. Kilauea had a good number of sports teams made up of workers who competed against other teams around the island in sports like baseball, soccer, basketball and boxing. Since Kilauea was a company town, it developed as the company and its employees needed. When new populations of immigrant workers arrived, homes and dormitories were constructed and churches were built as the plantation saw fit. Eventually, as more and more needs were addressed, the town of Kilauea began to take shape. One thing you’ll notice is the presence of fieldstone buildings. Fieldstone is a material more commonly associated with building practices on the on mainland (most Hawaiian stone buildings use lava rocks), but when you have a workforce of hundreds plying thousands of acres of plantation, fieldstone becomes an easily sourced material. 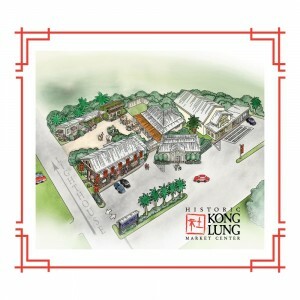 One example of fieldstone construction in Kilauea is the Kong Lung Marketplace Center, which dates to the 1860s when it served as the company store. Back then it was a woodframe building but was later rebuilt in stone. By the 1960s, it became apparent that Hawaii’s reign in the sugar industry would not last much longer. Cane was being grown for much cheaper prices around the world and the big plantation business model was rapidly nearing its end. In 1971, Kilauea Sugar Plantation conducted its last harvest, and with it, closed a significant chapter of Kauai’s history—one where a massive social and agricultural revolution took place on the island’s north shore over the span of 100 years. For the next few decades, Kilauea went through an economic decline as it figured out how to exist without the sugar industry’s momentum. Strangely enough, the winds of change blew in (literally) with 1992’s Hurricane Iniki, the most powerful hurricane to ever strike Hawaii. The Category 4 storm tore right over Kauai with sustained winds up to 145 mph and gusts to 175 mph. While Iniki left incredible destruction in its path, it also created an opportunity to rebuild Kilauea Town and reinvent itself in a way that honored the past while looking at the future. Today, Kilauea remains very much a sugar plantation town—only without the plantation. Its buildings and residents recognize the generations who came before them, carved a living from the land, and worked side-by-side no matter what part of the world they came from. Kilauea is still a melting pot, but in a way that only an Hawaiian town could exist.